Look yonder oh believer and ye shall be struck by the might of the holy fist pump of St Ange. For his story is the story of us all, from callow youth to successful man, from pariah to messiah, the Socceroos Saviour readies himself to renew the Faith and take us on a journey to the Holy Land of Brazil 2014. Three wise men followed the evening star nestled deep in the azure of Aegean sky. They carried gifts of Papastratos unfiltered cigarettes, ouzo and a football. In a Greek manger on 27 August 1965 an angel was born, Angelos Postecoglou. At the age of five, Ange’s parents did what thousands upon thousands of Greeks had done in the 20th century, they left Greece in search of a better life. They became part of the antipodean diaspora. His parents settled in Melbourne, Australia. His father, like many other Greek fathers with a passion for football, took young Ange to Middle Park to watch South Melbourne Hellas. Seated in Middle Park’s cacophonous tin stand, he watched on as the crowd munched on their pumpkin seeds, chanted “Hellas! Hellas!”, and abused the referees, the away players and their own players not worth their salt with earthy Greek epithets. Ange wished he was out there playing in the blue of Hellas. South Melbourne Hellas coach Len McKendry looked on as 18-year-old Ange went through his paces in training. Ange knew he was close to realising his dream of playing for Hellas in the National Soccer League. “Boss, do you think I’m ready to play with the big boys?” he asked. “When you’re old enough to grow a proper moustache… that’s when I’ll know you’re ready to play,” McKendry replied. Ange did what many boys his age couldn’t, he grew a moustache. He was ready. On 15 April 1984, Ange made his NSL debut. In front of a crowd of 7000 at Middle Park he came off the bench in the 15th minute to replace an injured Alan Davidson. The match against a Sydney City side featuring John Kosmina and coached by future Socceroos coach Eddie Thomson ended as a scoreless draw. By the end of the 1984 season he had become a regular for Hellas at left back. It also turned out to be the season Hellas won their first of four NSL championships. Ange played an instrumental part in all of them. On 28 October 1984, in the second leg of the NSL Final, mercurial Sydney Olympic striker Marshall Soper turned Ange into a traffic cone, but this did not stop Ange. He was born a winner. A year after the Socceroos brave, but ultimately doomed, World Cup qualifying crusade which ended at the hands of Scotland, their manager, Frank Arok, went into rebuilding mode. He was on the lookout for new “Mad Dogs”. On 3 August 1986, on the cusp of his 21st birthday, Ange made his Socceroos debut in the opening game of a three match series against Czechoslovakia. The match finished 1-1. He also appeared in the third match where he tasted his only defeat in the Green and Gold, a 3-0 drubbing. After being ignored by Arok for the Bicentennial Gold Cup, Ange appeared only twice more for the national team, this time in October 1988 against New Zealand. Ange played four times for the Socceroos, all in friendlies. He was good, but he was no Alan Davidson. He came to accept that the only chance he had to reach the Holy Grail of the World Cup was not as a player, but as a manager. On 5 May 1991, Ange, now captain of South Melbourne Hellas, stared Grand Final defeat square in the face. His team had had been played off the pitch by a rampant Melbourne Croatia. Now here he was, placing the ball on the penalty spot as the fifth penalty taker. He had just seen South’s three previous kicks squandered. He had also just seen Alan Davidson, instead of sealing victory for Croatia, hit the post. With South behind 2-1 in the shootout, he knew he had to score to keep any hope alive. Yes, his penalty hit the underside of the crossbar, but it went in. Mark Silic had a chance to win it for Melbourne Croatia, but he hit his penalty a few inches higher. South Melbourne went on to win in sudden death. Ange lifted a trophy his club had basically stolen from Melbourne Croatia. He played in two NSL Grand Finals and never tasted bitter defeat. Ange hung up his boots in 1993 due to a severe knee injury and turned to coaching. On 12 April 1996, with only a few weeks left in the 1995/96 season and South Melbourne assured of missing out on finals action, the club parted company with their coach Frank Arok. At the age of 30, Ange Postecoglou took over in a caretaker role for the remainder of the season. A few days later he won his first game as coach at South’s new home ground, Bob Jane Stadium, against West Adelaide 2-1. Five rounds into the 1996/97 NSL season the noose was being tightened around the young coach’s neck. The club was bottom of the table, winless and had lost both home matches. The trapdoor was about to swing open when, on 17 November 1996, Ivan Kelic saved Ange by scoring the only goal, the winning goal, against the Newcastle Breakers. The Bob Jane Stadium hanging committee gave Ange a stay of execution. 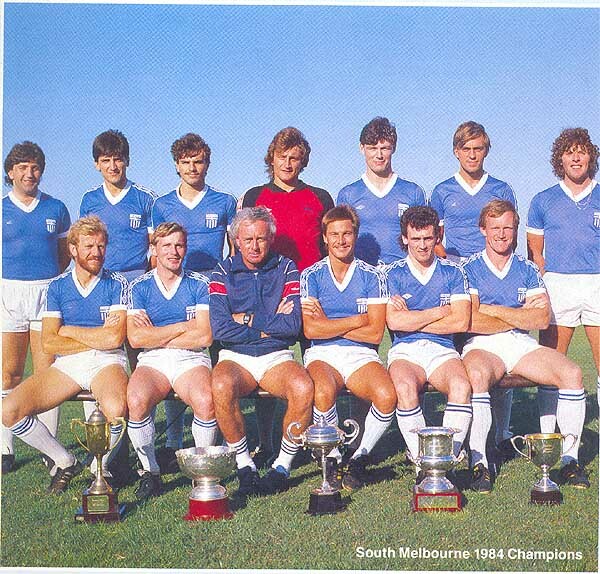 From a precarious start, South Melbourne marched into the finals that season. They thumped Melbourne Croatia 7-1 over two legs and only a solitary goal by Sydney United striker, Ante Milicic, stopped Ange from making the NSL Grand Final in his first full season as manager. In his second season as coach, Ange took South Melbourne to the 1997/98 NSL Grand Final where they met NSL debutants Carlton at Melbourne’s Olympic Park. In the 85th minute, with scores locked at 1-1 and extra-time approaching, Ange went to the bench. He took off John Anastasiadis for Con Boutsianis. In the 89th minute, Boutsianis ran on to a great ball from Trimboli, barged the Carlton defender, Douglas, off the ball and scored the winning goal. Those who still doubted Ange as a football divinity in the making were rendered mute the following season. On 30 May 1999, in his third season as coach, he took South Melbourne to their second consecutive NSL Grand Final where they met Sydney United at Melbourne’s Olympic Park. With the score locked at 1-1, Ange went to the bench. He took off Michael Curcija for John Anastasiadis. Ten seconds later, the miracle happened. Anastasiadis went on to score the sealer with one of the best team goals seen in NSL Grand Final history. Ange coached in two NSL Grand Finals and never tasted bitter defeat. On 6 January 2000, South Melbourne, in their opening game of the FIFA World Club Championship, faced Vasco Da Gama in front of 66,000 Cariocas at the grand temple of football, the Estádio do Maracanã in Rio De Janeiro. His mere mortals fought valiantly against the local titans Edmundo, Romario and Juninho. They were vanquished but not humiliated. Ange had conquered all in Australian club football club. During the match he had a vision. He was at the World Cup. He was in the football Holy Land of Brazil. He was on the sidelines and the green and gold of Australia was on the pitch; not the blue of South Melbourne Hellas. Ange served his apprenticeship as coach of the Socceroos youth teams with patience and diligence. During this time the great schism happened: Old Soccer became New Football. The NSL era was extinguished, the A-League created and clubs like the one Ange had so proudly served were consigned to the provinces. Australia’s Medici of football, Frank Lowy, sacked the very person Ange was understudy to, Frank Farina. Under Guus Hiddink, the Socceroos qualified for the World Cup for the first time in 32 years. All of a sudden expectations of Australia’s place in the football world rose, unrealistically so. With the football talent production line drying up, Ange could not deliver the expected results. Could it be that Ange was a false prophet? On 12 November 2006 , Australia’s own Doubting Thomas, Craig Foster, certainly thought so and led the charge for his crucifixion. In February 2007, the Young Socceroos failed to qualify for the Under 20 World Cup. Ange was banished. Cast into exile, Ange returned to the country of his birth to prove himself at the biggest club, Panachaiki, in Greece’s third biggest city, Patras. The old red and black club — which according to legend was founded by anarcho-christians, anarcho-communists or just plain old anarchists — was wallowing in the Greek third division. Ange was on a mission to march them back to where the club belonged, the first division. But he had a problem, the club was owned at the time by an egomaniac lawyer and a meddling billionaire Greek-Australian property tycoon. Behind his back they had decided to acquire 12 players and release a similar number. Yes, you read correctly, 12. It was the straw that broke the camel’s back. On 21 December 2008, he resigned immediately after the final whistle. He walked over and thanked the fans and departed with a record of nine wins, five draws and two losses. He left the Sodom and Gomorrah that is Greek club football. It was time to return home and conquer the New Football frontier in Australia. All it took was one breath on 10 October 2009 to change New Football in Australia. On that day Brisbane Roar coach, Frank Farina, blew over the limit at 7am on his Saturday morning drive to training. A few days later Ange was appointed coach of Brisbane Roar. He took to the role with missionary zeal. He cast out the old boys’ club from the dressing room like a messiah of old had cast out money lenders from the temple. He began teaching his players how to play modern football built on passing, movement and pressing. Slowly but surely, the team started to gel. Slowly but surely, the old doubters returned to the fold. Slowly but surely, New Football fans who had no idea who this stranger was, joined the flock. And just to prove he had not lost his touch, Ange’s team provided everyone with the biggest miracle ever seen in NSL/A-League Grand Final history. He was still not satisfied. Brisbane Roar went 28 games undefeated and won a second consecutive championship. Ange coached in two A-League Grand Finals and never tasted bitter defeat. Ange returned home to Melbourne. He was in the middle of building an Australian football juggernaut at Melbourne Victory when something happened. Ange woke up early on the morning of September 8 2013 to watch the Socceroos play Brazil in the football Holy Land. During the match the vision returned. He saw himself on the sidelines coaching the Socceroos in the Holy Land at the 2014 World Cup. He then watched Holger Osieck, the Socceroos coach, the man who had qualified Australia for the 2014 World Cup, deliver his own head on a plate. The Socceroos had dragged their name through the mud with an abysmal display. Their reputation as a worthy international opponent was in tatters. The Socceroos needed a new coach. Australia’s Medici of football had a decision to make. Ange waited for the phone to ring. The Medici called and made him an offer he could not refuse. David Gallop, the Medici’s factotum, gave this account of what happened next. “Once Ange spoke to Frank a few weeks ago, the contingency plan was in place and once the France game happened the wheels were put in motion. “The mission was get Ange. We never underestimated the headaches it was going to cause Victory and we are grateful for their ultimate acceptance of the position. In the end Melbourne Victory were compensated with a load of lemons. On 23 October 2013, Ange Postecouglou was appointed as head coach and Saviour of the Socceroos. He now has five years to turn himself into something greater – an international gold standard football manager.